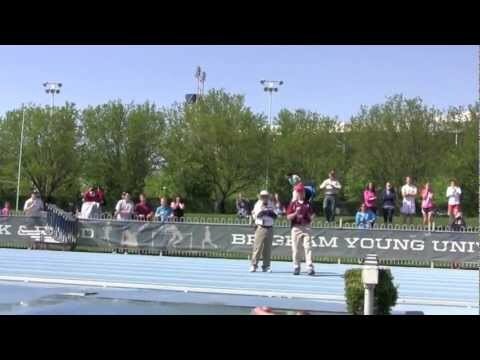 Published: May 2, 2012 2:00 pm Updated: May 2, 2012 3:03 p.m.
BYU runner Katy Andrews had an embarrassing moment while participating in the steeplechase at the Robison Invitational last weekend. She fell while trying to jump over a steeplechase, and suffered injuries. But she has been a good sport about the incident, as she posted the video of her fall on YouTube. While four former Cougars — Matt Reynolds, Terence Brown, Hebron Fangupo, and McKay Jacobson — have signed free agent contracts, another former BYU player, Matt Putnam, has been invited to the Green Bay Packers' three-day mini-camp. He has not signed with the team. BYU's Daily Universe provides a photo gallery of the new Marriott Center seating construction. Bleachers are being removed to make way for new chair seats. BYUtv will replay the Cougars' NCAA Tournament comeback against Iona on Thursday and Saturday.